For the Unreal Level, see Vortex Rikers. The UMS Vortex Rikers, designation NC114-85EKLS, also called Prison Vessel 254, is a prisoner ship in the service of the Unified Military Services. The crashed remains of the Vortex Rikers, in NyLeve's Falls. The Vortex Rikers is a prisoner transport vessel that picked up prisoners from various planets, sending them to their incarceration on a prison moon. It had a reputation for being "The rankest prison transport vessel this side of The Milky Way". 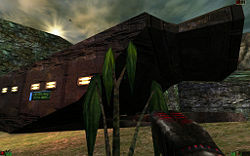 The Vortex Rikers crashed on the then uncharted planet of Na Pali after being unable to escape the planet's gravitational pull, rendering the ship unable to resume flight. The ship crashed in the NyLeve's Falls region of Na Pali. Many of the prisoners and guards were killed outright from the crash or in attempting to find a way to escape from the planet, however, one Human, Prisoner 849, is known to have escaped not once, but twice. Based on a number of translator events, it is assumed that Unreal describes humanity's first contact with the Skaarj, although this is never specifically mentioned. The ship's designation, "NC114-85EKLS" is a kind of Easter egg showing the level builder's name: Juan Pancho Eekels. In Unreal Tournament, the symbol of Vortex Rikers, three jail bars with a lightning bolt in the middle (probably a reference to the electrical barriers mentioned in the manual), is the symbol of the blue team. This page was last edited on 29 April 2009, at 09:15.